How do social networks influence risk perception? How do risk perceptions spread? Social networks serve as important channels in which people share, receive, and exchange information about risk and risk-related events. People observe and interact with members of their personal and professional networks to identify hazards and determine the acceptability of associated risks. In turn, these networks may facilitate amplification or attenuation of risk perceptions throughout a community, as well as motivate individuals and groups to take actions to avoid, tolerate, or modify the risk. Social contagion—the diffusion of ideas, practices, or technologies through relationships among network actors (i.e., individuals, groups, organizations, or institutions)—arises from these social interactions. Past and current interactions aid in the flow of information and influence, and affect individual and group decision making. Despite recognition that interpersonal contacts are important sources of social influence, few studies have explicitly explored if and how risk perceptions are influenced through social contagion. This research stream explored the antecedents and consequences of risk perception by studying social networks associated with managing environmental risks, such as those that frequently exist in wildlife management. Muter, B. A., Gore, M. L., and S. J. Riley (2013). Social contagion of risk perceptions in wildlife management networks. Risk Analysis, 33(8): 1489-1499. Muter, B. A. Gore, M. L., and S. J. Riley. (2011). Toward exploring stakeholder and professional information sources about cormorant management in the Great Lakes. Human Dimensions of Wildlife, 16 (1): 63-66. Muter, B. A., Gore, M. L., and S. J. Riley. (2009). 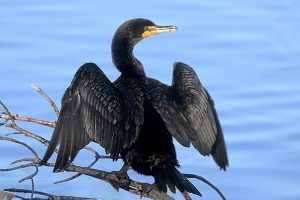 From victim to perpetrator: evolution of risk frames related to human-cormorant conflict in the Great Lakes. Human Dimensions of Wildlife, 14(5): 366-379. Gore, M. L., Riley, S. J., and B. A. Muter (2009). Improving decision making in contentious Great Lakes fishery management. Project Completion Report to the Great Lakes Fishery Commission. Ann Arbor, MI.